The man who told me I didn´t know much about horn playing. Willi Aebi changed my life. It was 1964, during the ARD Competition in Munich. As you know, I won first prize there. at the event that would change my life and my playing forever. Every day I played in Munich, a man was there who made it a point to sit in the same place in the hall, so he could watch and listen not only to what I was playing but also to how I was playing. He was a horn player, himself, who knew more about horn playing than I did at that time; and he knew it! At the end of the competition in Munich, it was then announced that I won first prize; I was the only instrumentalist who was awarded a first place prize. Among the participants that year was Jessye Norman, who received second place in the catagory voice. As you could imagine after the announcement, I went back stage where people had lined up to congratulate me. When he got out of the car and went into the airport, Hella and I just looked at each other in amazement! A short time later, we visited him, and from that day on, it was the beginning of a wonderful, wonderful friendship. He was a great collector of natural horns and was the owner of a Swiss company that specialized in manufacturing farming equipment. Naturally, that allowed him the financial middle to acquire and preserve very, very rare natural horns. He then would use his free time to follow his greatest passion, horn playing. Later, when my wife and I arrived at his house in Switzerland and walked for the first time through the front door, you cannot believe what we saw! I had never seen one before except in books, and then so many in one place….fantastic! 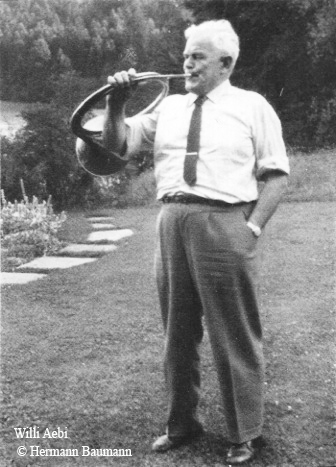 Through Willi Aebi, I came to natural horn late in my career, 1964! In Willi´s mind, it was logical what I was missing. I was only thinking in terms of the modern valved horn. Bach, Telemann, Händel, Chabrier, Rossini, Beethoveen, Mozart, Schubert, Rosetti all wrote their music for the natural - hand horn; not for the valved horn! When you play natural horn long enough, it changes you. The horn shows you how the music was meant to be played. The natural horn gives the modern-day horn player the full picture, connecting the past to the present. Willi Aebi saw that I was playing a single Bb Alexander Horn in Munich. He could hear that was all I knew. He had great knowledge about double horns, too, not just natural horns. He even constructed a horn himself that Alexander then built; I have it up stairs in the attic. But back then, nobody was playing natural horn. No one! So, he gave me two of his best horns that were over 200 years old to take back with me to Stuttgart. And then, I started to play natural horn. I chose not to read any books on natural horn playing. I didn´t want to have any preconceived ideas about it running around in my head. It was very important for me to learn to play natural horn, my way. It took me three years before I felt I was ready; at that point I was pretty good. Then, I started playing it in Harnoncourt´s Ensemble ” Concentus Musicus Wien,” where I was able to cultivate my playing even further. In 1972, Harnoncourt and I recorded the Mozart Concertos with the natural horn, and well, the rest you know. Coming back to Willi Aebi though, I also want to share with you something else that you might not know about this remarkable man. He not only brought me to natural horn but also paved the way for one of our most treasured concertos, the horn concerto by Othmar Schoeck. He was good friends with Othmar Schoeck, and Willi had been after him for years to compose a small piece for horn. He would always ask him, “Othmar, compose just a little piece….just a small one?” It was important to Willi. So one day, Schoeck gave in and began writing, and writing, and writing, and after two full months with Schoeck on piano and Willi on horn in his living room, this small little piece became the mammoth piece that we all know today. Ha, ha,…it was just supposed to have been a little song, but it then evolved into a major challenge for horn players to this day! Breaks in the piece to rest? There weren´t any! Willi was a very good horn player. He had a good technique, but Othmar pushed him to his limits! In 1970, I recorded the Schoek concerto along with the Schumann Konzertstück and the Weber Concertino with the Wiener Symphoniker. I have been a member of the “Othmar-Schoeck-Gesellschaft” (club) in Zürich ever since that time. 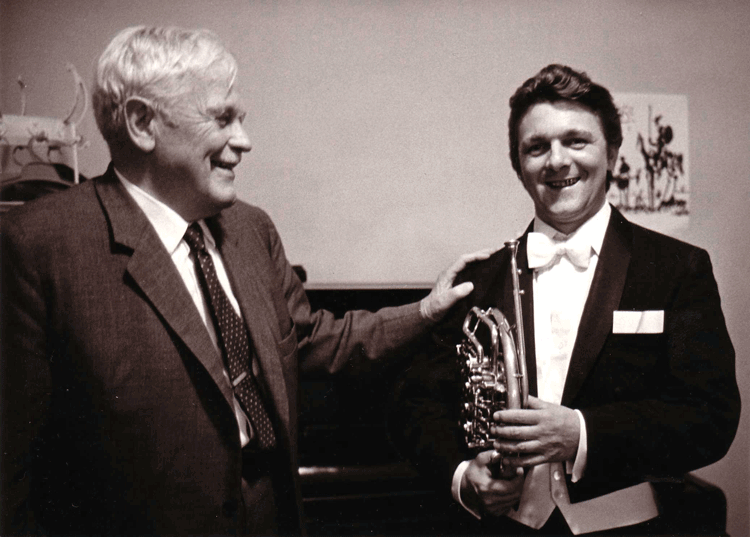 The man who taught me a lesson on horn playing that I will never forget, Willi Aebi. Now, I hope that horn players around the world will know who this wonderful man was and what he has done for us all. I’m very happy of this your testimonial, I’m a italian horn player and I was young and student in ’80 years I grew up listening to your art in playing the horn, on vinyl records and live in your concerts. Your testimonial remember me a concept very important: To know the french horn at 360° it’s important to study and play every evolution of our instrument!!! 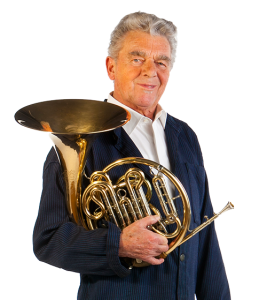 You are for entire generation of horn player into Olimpo (The best ever)…….you have demonstrated with this story, humbly and have never stopped studying to improve! Best wishes and I hope to meet you again! vielen Dank, daß auf Ihrer tollen neuen Website auch das Naturhorn einen namhaften Platz hat. Der Bericht über Willi Aebi hat mich beeindruckt, denn auch bei mir hat das Naturhorn mein Verständnis vom Spiel auf dem Ventilhorn für immer verändert und mir neue Perspektiven eröffnet. Thank you very much for this email. I am an O.B. (“Older Beginner”) and I look forward to reading about your knowledge of horn playing. I play your “Perspectives” CD often and love your sound.